By following certain practices, HIM departments can rest comfortably knowing they have workloads under control. The term “sandbagging” is most often used when describing efforts to prevent catastrophic flooding, but it can also be used to describe the idea of a hidden truth. Sandbagging also has different meanings inside the transcription industry. When transcription overflow occurs, it’s a good idea to have protection in place (sandbags, if you will) by establishing a partnership with an outside transcription service organization. Just as important, it is vital that those running transcription departments avoid the other form of sandbagging by using accurate data to predict and manage the ebb and flow of the department’s workload. Sherry Doggett, director of corporate transcription at UC Health Corporate Transcription Services, and Ava George, CMT, AHDI-F, president-elect of the Association for Healthcare Documentation Integrity (AHDI), have both experienced the pressures associated with handling transcription overflow. Doggett oversees the transcription workload for a large four-hospital system, while George’s facility includes a 735-bed main hospital and six community hospitals. In a multihospital system, Doggett says collecting data to determine a facility’s transcription cycles is an excellent first step in mitigating problems associated with overflow. “We collect data 24/7 and input volumes by minutes. It is broken down to six-hour blocks so that I can align scheduling around those times and create a staffing model to accommodate certain peak times. Peak periods are pretty consistent. It is important to figure out how your organization can capture statistics and use them to identify workflow,” she says. Doggett says if there’s not enough staff to accommodate the volume, a facility will have to decide whether it will train additional staff or outsource. “But first you have to get a handle on what your volumes are,” she adds. George, who works in a teaching hospital, agrees that data collection is key to determining volume; like Doggett, she also breaks out data by department when necessary. “For the general transcription, I break the data down into 12-hour slots, but for radiology, for example, I use a six-hour breakdown,” she says. George notes the amount of transcription fluctuates at various times of the year. For example, workflow can get dicey when residents are about to graduate and when incoming residents are beginning to use dictation. “We found that each June, when the residents are about to leave, there is a lot of data dumped that needs to be completed before they leave, and again in July when the new residents arrive and they are learning the system,” she says. Without data, says Doggett, overflow occurs because there is no plan in place. “Lack of planning is where many managers fail in forecasting for peaks and valleys. I would say that nine times out of 10, the historical patterns are pretty accurate,” she says. It would take a significant event, such as adding a facility, to completely change the pattern of transcription workload. Doggett also recommends having backup plans and planning for the future. “At our facility, the next version of eScription will be launched. I know that some staff will need training and that we will need assistance during that training and meeting time, so I have to break down and analyze the workload,” she says. When George began working at her facility, there was no overflow plan in radiology, and it took six months of collecting data and trying various strategies to finally get a handle on the workload. “You need data to drive the process. In radiology or oncology, you can’t be three days behind because those are critical patients. You never want to get caught in a situation where you have something a physician is looking for because that means a patient is waiting,” she says. In Doggett’s first year, she had nine staff take maternity leave. “Talk about having to plan. But it was a good learning experience. It’s just important to have a plan for the unexpected. We are human beings and have lives and sometimes need to go to training or educational classes,” she says. Without a plan, overflow problems can have a trickle-down effect across departments, including coding and billing, and can potentially wreak havoc on the revenue cycle, especially for more expensive procedures. George recommends being consistent about how data are pulled to create a history of the transcription workload throughout the year. It’s important to consider what needs to be gleaned from the information, including issues such as turnaround time, why data get lost in the process, and gaps in turnaround time that are physician driven. Keep in mind that areas such as radiology and pathology will have more data elements. “It’s turnaround time, volume, a lot of different information. You have to look at historic volume, current volume, as well as plan for the future,” says George. Doggett says to keep an eye open for volume increases. Should a trend be spotted, the historical data may need adjusting. She finds that once a data collection process is implemented, it can be refined along the way to include the amount of data needed to make informed decisions. Both Doggett and George turn to outside contractors to help alleviate overflow. George notes the importance of having a solid relationship with outside transcription contractors. “Many hospitals have the ability to turn on or off the outside contractors, so you want to create a relationship where they will be able to help when you need them,” she says. “I hope we are moving away from a usury relationship with outside transcription vendors. If you have a really good relationship by sharing information, you will get the quality of results that you want. You have to plan for the peaks and valleys,” adds George, who recommends facilities enter into a partnership that will allow time for a vendor to get up to speed with expectations. “It doesn’t always happen on the first time. I used two sources until I found the right fit. It is a lot of work—an insane amount of work—but when you find the right partner, it is worth it,” says George, who fostered a relationship with a specialized radiology overflow company, which she says is sometimes difficult to find. Data collection and forming a sound vendor relationship are the two keys to successfully managing overflow, says Doggett. Lee Tkachuk, CEO and president of Keystrokes Transcription Service, Inc, which provides outsourcing services to more than 125 hospitals and clinics, agrees with Doggett’s and George’s assessments on how best to manage transcription overflow. 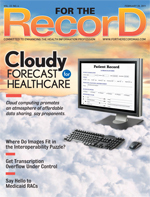 “It is hard to predict the ebb and flow of transcription needs simply because a facility’s census changes every day. It could be at 25% capacity one day and 100% the next,” she says. Tkachuk says there are many factors that contribute to facilities experiencing overflow, but there are also patterns as well. For example, in November and December, when patients are trying to fulfill their healthcare deductibles, volume can increase. Other factors, such as weather-related incidents, can suddenly change a facility’s census. “If there is a blizzard in one part of the country or a hurricane in another part, we can often expect an increase in transcription,” she explains. Many transcription departments turn to outsourcing because it provides additional resources that will prevent overflow from occurring in the future. Some facilities are not permitted to pay overtime, so they turn to outside help. A Keystrokes client in the midst of a hiring freeze has outsourced its overflow for years to accommodate for shortages in certain work types. “We can train someone from our staff for a few specific facilities so that they can jump right in and be up to speed with that facility’s needs and work type,” says Tkachuk. Ray Dyer, CEO of Acusis, a Pittsburgh-based medical transcription services organization (MTSO), notes there are other factors besides seasonal fluctuations and insurance factors that can trigger overflow. For example, as more patients opt to use the emergency department (ED) as a pseudo family practice, the amount of transcription generated by that area has risen. Plus, it’s difficult to predict ED volume as patients arrive on weekends or off hours when staffing may be lower. Scheduled vacations, sick days, and training time can leave a transcription department shorthanded and trigger overflow. “And sometimes overflow is caused by a backlog in terms of reports not being quickly generated and signed off on,” adds Dyer. If reports are not completed in a timely manner, it affects a facility’s ability to keep its revenue cycle running smoothly. Coding, billing, accounts receivable—departments dealing with cash flow—are affected when overflow is not managed. Dyer says that in today’s reimbursement system, it is a huge issue for facilities if the process is not working well. However, Tkachuk says the top reason that facilities should stay on top of transcription overflow is the effects it can have on quality of care. “Transcription is the first leg of the billing process but, ultimately, having it completed properly affects patient care. If a report is not done in a timely manner, decisions on patient care can be delayed,” she explains. Dyer says overflow problems can have the most devastating consequences in specialties such as radiology, cardiology, and oncology where turnaround time can affect critical decision making. “With overflow, you will not have as high quality of patient care because when medical records are not in the hands of every healthcare professional treating a particular patient, it affects the delivery of quality care,” he says. From a vendor standpoint, Tkachuk recommends facilities establish parameters up front to indicate their needs. Whether it be for a certain work type or for certain hours or days, it can help a vendor prepare and be able to provide the service and quality expected. By creating a strong partnership between a facility and an MTSO, Tkachuk says both can monitor and manage the overflow. She cites an incident when a Keystrokes manager had observed a steady climb in a client’s level of transcription and wondered why it had not called for extra coverage. When the manager contacted the facility, the transcription director admitted she had been so busy, she hadn’t realized the situation had become dire. To handle overflow, Dyer recommends using either overtime within the facility or increasing the amount of outsourced transcription. Even if a facility doesn’t typically use outsourcing, it can contract with an MTSO to eliminate backlog and provide the same level of ongoing service, which would help it handle potential future spikes in volume more easily should they occur. Dyer says it’s vital to establish a contingency plan and a working relationship with an MTSO rather than reaching out for help only in an emergency. “It can be useful to depend on a partner even for just certain work types just to have that relationship in place,” he notes. From an MTSO perspective, establishing a partnership helps it plan for workload. “We can’t slip in quality or turnaround time just because we suddenly get a spike in transcription,” says Dyer. Facilities need to have a partner in place before an emergency so the vendor will have proper identification and clearance to work in the client’s system. “Often when an emergency situation occurs, people are too busy to put all that in place, especially when they are in the middle of a high-volume period,” Tkachuk says. Dyer says healthcare organizations must create space in workflow capabilities to create a buffer between capacity and demand. “Think ahead and make future projections in volume to create a cushion. I like to have a 10% to 15% range in my organization,” he says. In addition, Dyer says if an HIM department finds physicians are falling behind with dictations or if there is a physician with problematic dictations, it is a good idea to implement critical standards and quality measures around dictation processes to prevent backlogs. “This is especially important in teaching hospitals where sometimes dual signatures are needed to sign off on a document. With a constant flow of residents, it is important to have clear procedures on how work gets done,” he explains. Monitoring volume daily and frequent quality and performance measurements are crucial to ensuring the workload is in balance.